After the tournament Call To Arms 2014 i decided against having a Mage general, in both my first and last game my mage general decided to get sucked down a hole which meant that the first game was a bigger lose than it would have been and it meant the last game was a lose rather than a win. For my Skitterleap list i decided upon a mobile Machine Gun/Bow Glade Lord, my reasoning behind this was that he would both more useful (he can shot chaff, hunt chaff, hunt warmachines and seek flanks) and he would be easier to keep alive (his primary role didn't have a built in chance to get him killed without my opponent lifting a finger). However he has only seen a single game so far so i decided to do a tactics post looking at the Pros and Cons both both viable generic lord level Wood Elf generals in order to help any other fellow Wood Elf players who may be having similar issues, there will be a post in the future on Wood Elf special characters which will cover them and the reason why the Treeman Ancient isn't in this post is because i no longer consider him a viable general choice for reasons i will come to later. Forest Dragon: The Glade Lord can ride a Forest Dragon where a Spellweaver cannot (he can also ride a Stag but the Weaver's access to a Unicorn makes that a moot point). Greater Customization and Combat Roles: The Glade Lord can access a much wider armoury allowing him to fill many roles that a Spellweaver cannot. Better Leadership: Glade Lords have Leadership 10, and this is a definite advantage over the Spellweaver when choosing a General. Cheaper: A tooled up Glade Lord is cheaper than a tooled up Spellweaver. Very Limited Magic Access: With only access to the Wizarding Hat (which is 100 points) the Glade Lord doesn't have access to one of the more powerful parts of WHFB. Frontline Commander. Most people will have their Glade Lord end up in combat sooner or later and thats bad news. Wood Elves as a whole don't believe in Armour Saves and this applies to Characters as well. The best set of saves a Wood Elf Character can get is a 3+ Armour and a 4+ Ward (true they can get a 2+ armour from the Armour of the Slivered Steed but i think thats worse than a 3+ 4++). This means that Glade Lords tend to die easily in combat, and you want them near combat for their Leadership to take full effect. 10 Lores of Magic: With access to all 8 Rule Books lores, High and Dark magic the Spellweaver has a lot of choices when it comes to magical solutions to problems. Be it weakening or blowing up the enemies troops,buffing or resurrecting yours or just plain old turning into a Dragon and eating the enemy the Spellweaver can do it all. Access to Arcane Items: Dispel Scrolls, Channeling Staffs, The Scroll of Shielding and more are all examples of Arcane items that can protect your troops from spells. Miscasts: While there are ways to mitigate the damage from Miscasts (have your mage ride around on a horse out of base contact/small template range of your troops) nothing can mitigate the damage of having your mage general get sucked down a hole on the final turn of a game that you were winning (or any turn of any game of that matter), or have himself/herself loose enough magic levels to effectively make him/her a walking waste of points, points that are easy to kill and give the enemy 100 extra points if they do kill them. Worse Leadership. While LD 9 isn't bad on a general you probably want the highest possible, and the Spellweaver has the worse LD out of the two options being looked at. So there are the good and bad points about of both choices, but which one should you choose? At the end of the day it comes down to what you want in your army. 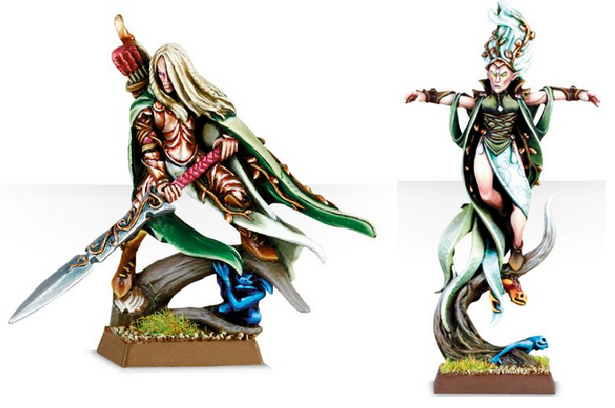 You can take both a Glade Lord and Spellweaver in your army however this means you will have less points to spend elsewhere, alternately you could decided to take only one and have more points but loose the benefits of the choice you didn't take. Both options have things they can bring to your army so there really is no wrong choice here (aside from one i will get to shortly). I now have a Glade Lord as my army general mainly because he is the more versatile of the two and his versatility doesn't come with the risk of getting himself killed. I am going to briefly mention my objections to the Treeman Ancient. Once he was a viable choice with access to some pretty ok upgrades. Nowdays Treeman Ancients aren't as tough combat wise as they once where and try to pretend they can be level 4 wizards with access only to the lore of life (for quite a big fee) and no access to any useful upgrades. If you have any desire at all to win a game you will not take a Treeman Ancient, grossly expensive and very easy to kill (Monstrous Large Target with a 3+ armour save and a 6+ ward), taking a Treeman ancient as your general would be like playing Warhammer on Insane difficulty, not impossible but very, very hard). Until next time.